Since I won't be having any gas on board I thought I perform the simple task of removing the gas locker. It wouldn't budge so I ended having to cut it out with my trusty angle grinder, I've left the door in place for now but that will have to come out soon. I managed to get hold of some ali locker door frames yesterday and 4 locks, they are the old fashioned type but were cheap and big (5 foot by 1 foot) So it means I can get away with only one locker door per side. Out with the angle grinder and I managed to get the hole cut out without to much trouble, the curves in the corners were a bit more tricky but I used a serious of straight lines to follow the curve as best I could. I then used a grinding disk to curve them and a file. After cutting out one I'd had enough for the day and I think my neighbours had to. Last edited by Phoenixsp1 on August 8th, 2015, 12:56 am, edited 1 time in total. That looks neat all the same, well done. Any change of heart on the neighbour front, do they still think you are mad! zildjian wrote: That looks neat all the same, well done. Yes, I think so, they probably call me Angle grinder man or something.. I don't think they quite understand what I'm trying to do, maybe I don't either ... I'll probably take the other side up my girlfriends Dad's farm to cut out, so I don't upset them too much.. The pictures I put up seem to be truncated as I hadn't made them small enough, is there anyway you can scale them for me please? Looking good all the same, if not gas on-board what are your plans for cooking? I just host on my own webspace, I've resized them to fit, I will try and use thumbnails in future can I embed raw HTML in the post? lamp-it wrote: Looking good all the same, if not gas on-board what are your plans for cooking? 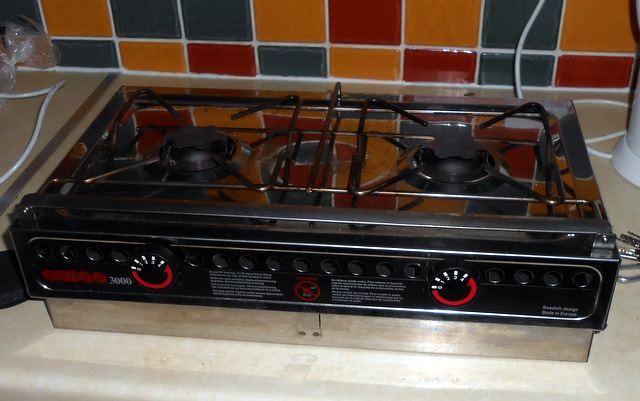 I mainly use an Origo 3000 spirit stove, its marketed more of a boat cooker. I like to cook outside as well as indoors so it saves having a fixed hob and carting round a second stove. It takes a couple of minutes longer to boil a litre of water compared to gas as it doesn't burn as hot. Some people don't like the smell of meths but I don't mind it. It will also run on Bio Ethanol which smells better. They are a bit pricey for what they are, the RRP is about £250 for this model.. I was lucky and found this one in the back of van at a guy I know who exports engines and breaks vehicles, I gave him a tenner for it. Its easy to clean, a very simple design and well built so will probably last a lifetime. The heat is very controllable so you can get a good simmer for general cooking, I find I can get a lower simmer heat than gas which is good for cooking things which normally boil over unless you regularly remove the saucepan lid. I've always been able to buy meths wherever I go in Europe so its handy for long trips. Since I'll have no gas I will also be taking out the 3 way fridge, I intend to use a Waeco compressor coolbox that I already have. 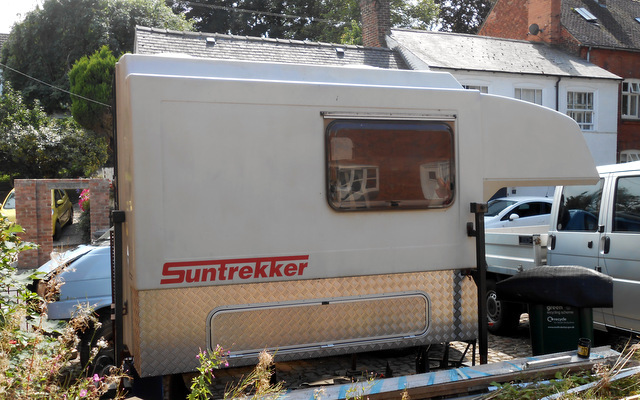 My Suntrekker had no heating but for that I'll be fitting a Diesel Eberspacher at some point. 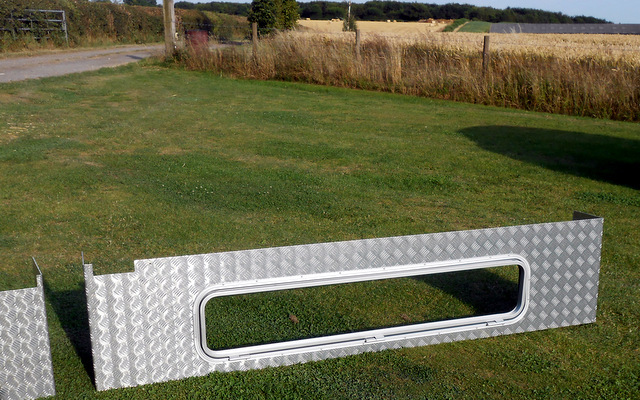 Not wanting to upset my neighbours , I worked up at the farm on Saturday and I managed to get the other side panel cut out to take the locker door. After a fair bit of fettling to the holes in both panels, I then added the numerous stainless steel screws to hold the frames to the panels. More angle grinder mayhem today why my neighbours are all at work and I got the infill panels cut out to the correct size to fit in the frames. That's approximately 50 feet of angle grinder cutting in the last few days, that's quite enough! Just need to add some ply / foam to the infill panels to make them up to 30mm thick and then I can add the locks.